We clean and seal all tile and stone surfaces including ceramic, porcelain, marble, concrete, vitrified, polished & unpolished porcelain. We are able to seal your tiles & grout to provide greater resistance to stains. It will also give better results when the tiles are professionally cleaned. OUR PROCESS- steps to restoring tile and grout. Our experts in Tile and Grout Cleaning in Melbourne inspect the floor and pre sweep/ vacuum to remove any loose soil. This loosens accumulated soils, grease, contaminants. 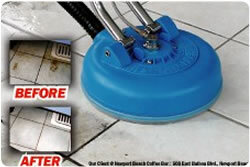 – Rinses the soil and detergent from cracks and removes soil buildup leaving floors fresh and clean. Top quality sealers used for grout lines and tiles, creates a waterproof barrier to prevent future stain.